Theo Walcott has backed Jadon Sancho to thrive with England after his shock selection. Borussia Dortmund forward Sancho, 18, has been called up for Nations League games in Croatia on Friday and Spain on Monday, both live on Sky Sports. He has started just once in the Bundesliga for Dortmund this season but has registered six assists and scored once. Everton's Walcott was just 17 when he was a surprise pick for the 2006 World Cup - although he did not play in Germany - having not made a senior appearance for Arsenal at the time. 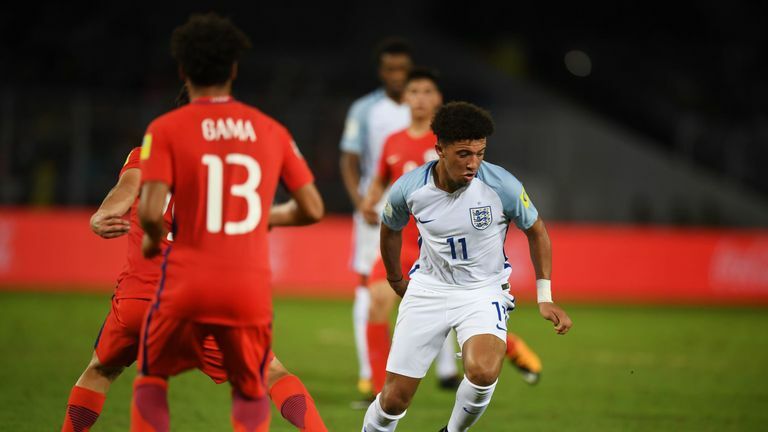 England manager Gareth Southgate explains his decision to include Borussia Dortmund teenager Jadon Sancho in his squad. And, after his experience, the forward believes Sancho can perform. "He can deal with it, he's been in the Dortmund dressing room, he's played at their stadium which is fantastic. He won't be fazed at all," said Walcott, who has 47 England caps. "It's completely different now, there are a lot of young players in that group. When I came through there was Frank Lampard, Steven Gerrard - completely established players in the team - so it's a different environment I would say. "Of course it's still daunting but when you get down on the field and play football that's all you want to do, you just want to play, it doesn't matter who it's for. "You just want to go out there and do your best and I'm sure everyone will. Highlights of Everton's victory over Leicester in the Premier League. "The young players with England is fantastic to see and they've just got to take their chances. Good luck to them all." Walcott has not played for England since November 2016 and confirmed he did not speak to manager Gareth Southgate before his squad was announced last week. He helped Everton to a 2-1 win at Leicester on Saturday as the Toffees moved into the Premier League's top 10. "We did play some good stuff in the first half, not quite finishing it off in the second half," he said. "We have worked really hard after the disappointment [losing to Southampton in the Carabao Cup] so to come back and get three points is great. It's 12 points now going into the international break, yeah, we're on the way up."